Callipterinella tuberculata spends its entire life cycle on Betula pendula and related species. It lays its eggs at the base of developing buds in autumn. The picture below shows the eggs at the base of a pair of catkins in spring. The eggs hatch the following spring. 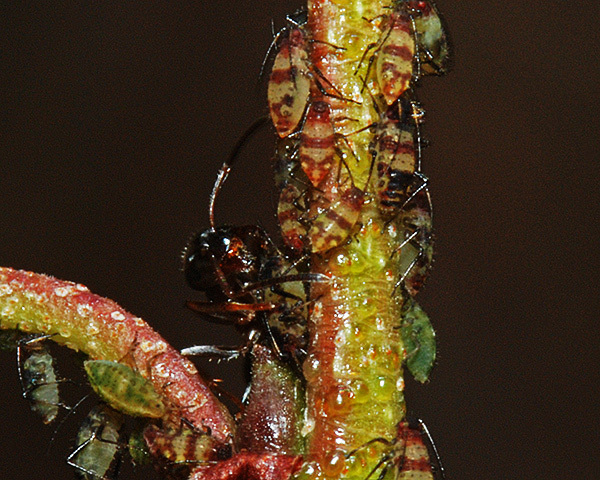 and the nymphs feed on the young birch foliage. Portha & Detrain (2012) studied the population dynamics of Callipterinella tuberculata in Brussels in Belgium. Callipterinella tuberculata was very abundant early in 2001, with a drastic decline at the beginning of July followed by a smaller second peak of abundance in late August. The trends were different in 2002 when Callipterinella tuberculata was scarce early in the year, only increasing when the Betulaphis brevipilosa population began to collapse in mid-June. Apterous males and oviparae can be found in September. Callipterinella tuberculata excels in producing a range of cryptic and/or aposematic colour forms. The first instar nymphs are light green which (most of the time) enables them to be very inconspicuous on birch leaves and shoots (see picture below). 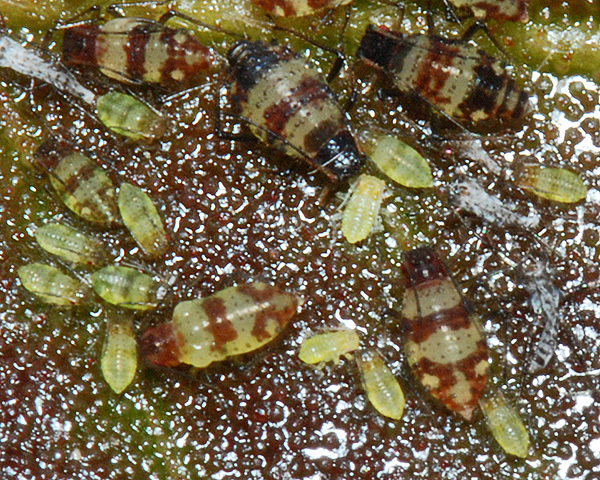 Later instars (III onwards) and adults have red brown bands, with a black spot added on the adult. The first impression this gives is of aposematic (=warning) coloration, but the effect can depend on the coloration of the particular leaf or shoot. Young birch leaves can be very reddish, as in the case of the leaf in the first picture below, in which case the aphid colouring is cryptic. Slightly older leaves tend to be pale green on the underside (see second picture below), and the aposematic pattern is more striking. The black and red patterning also suggests disruptive coloration, where a block of highly contrasting coloration and sharp boundaries prevent a predator from detecting or recognizing the preys outline (Caro, 2009). 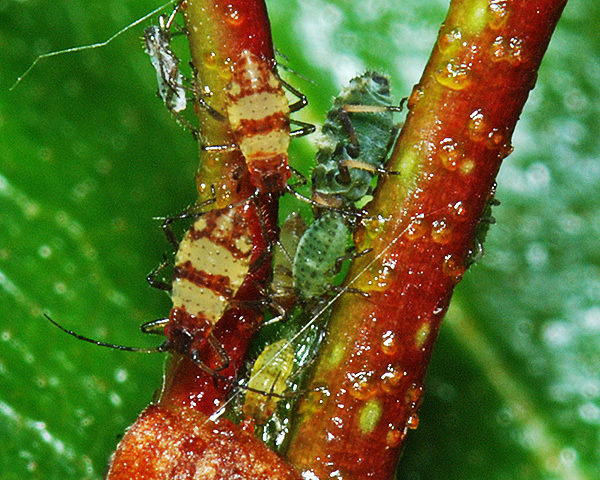 Just to complicate matters, when numbers build up on the underside of the leaf, it is not uncommon for aphids to spill over to the upper leaf surface (see picture above) which is a darker green. 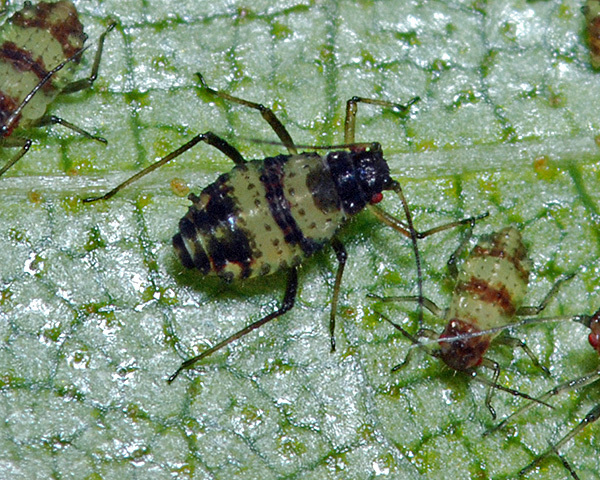 There the younger nymphs are colour-matched when on the mid-vein, but all stages are conspicuous on the rest of the leaf surface, with the red stripes especially noticeable. The aposematic coloration is likely to be targeted at insectivorous birds which have colour vision and can often be seen searching the leaves of birch trees for prey. 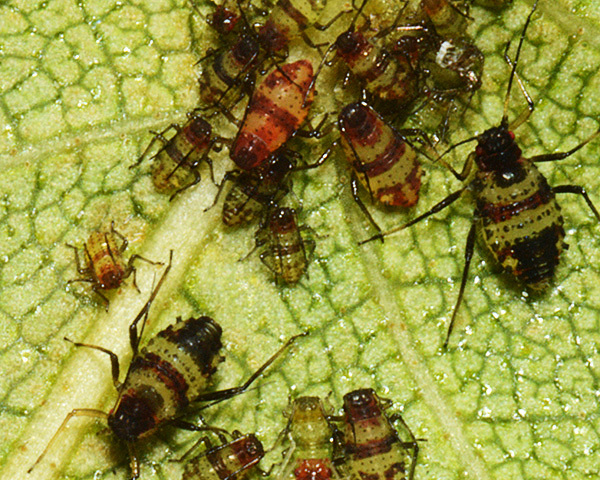 We cannot tell whether the aphids really are distasteful and are using a generalised warning pattern (=Mullerian mimicry), or are perfectly edible, but are mimicking a toxic or distasteful insect (= Batesian mimicry). Archetti (2000)proposed a coevolution hypothesis, namely that trees with bright yellow and red autumn leaves are advertizing that they are better defended against herbivores. Countering this, Holopainen et al. (2009) proposed that yellowing tree leaves are instead colonized by aphids at the end of the growing season owing to improved availability of nutrients in the phloem sap after chlorophyll degradation (the nutrient-translocation hypothesis). 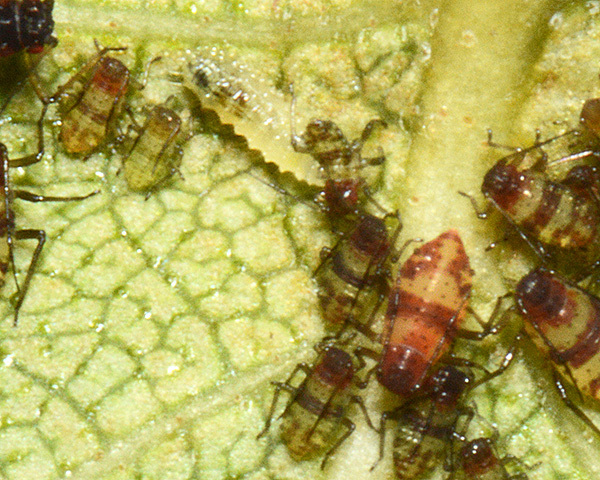 Holopainen tested his hypothesis by measuring aphid densities on potted Betula pendula seedlings in a field site where a small proportion of foliage rapidly turned yellow before normal autumn coloration as a consequence of root anoxia. 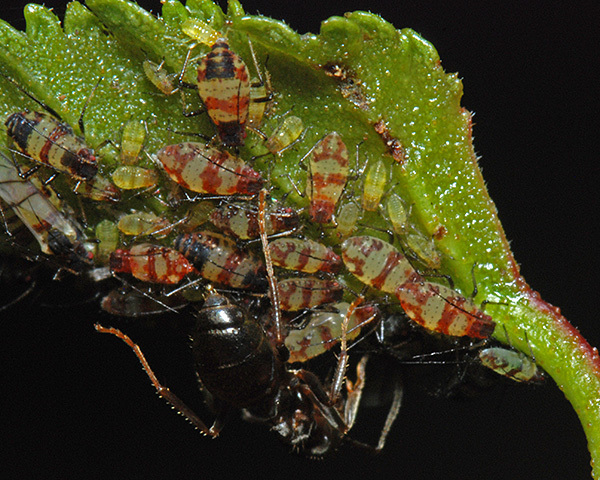 The number of adults and nymphs of the birch-feeding specialist aphids Euceraphis betulae, Betulaphis brevipilosa and Callipterinella tuberculata were counted from leaves on each of the 222 plants. 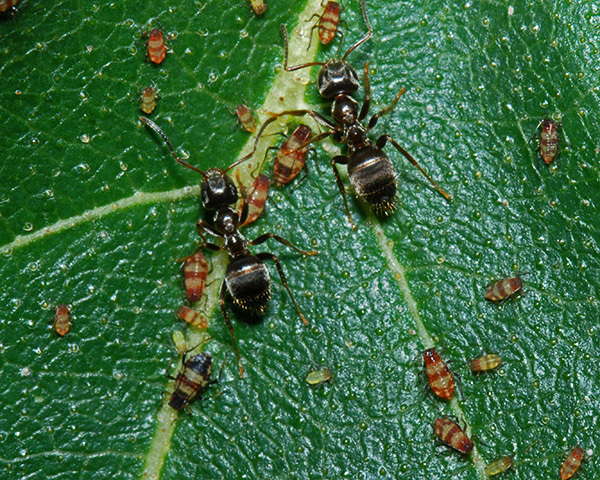 Aphids were detected on 19 per cent of green leaves and on 41 per cent of yellow leaves. The numbers of neither Callipterinella tuberculata (nor of apterous Betulaphis brevipilosa) differed significantly between the leaf colour types. 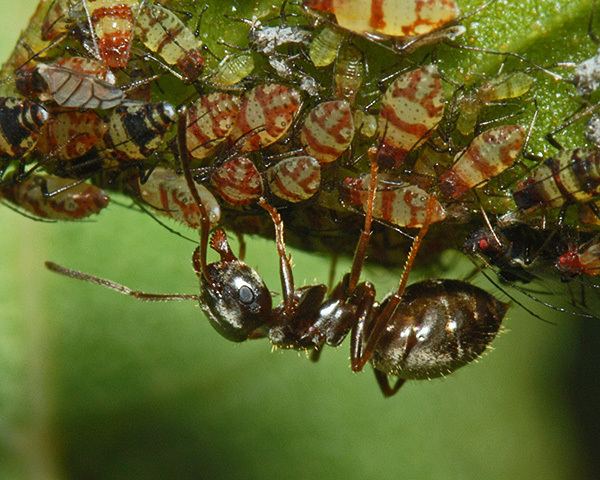 There was no indication of aphid avoidance of yellow leaves, and the number of winged (alate) viviparous Euceraphis betulae adults and their nymphs were significantly higher on yellow leaves than on green leaves. We have also seen no indication of avoidance of yellow leaves by Callipterinella tuberculata (several of the pictures below show them on yellowed leaves in September). 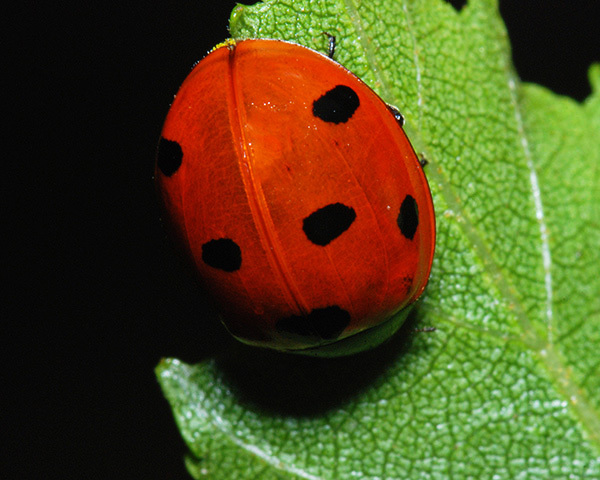 Aposematic coloration might dissuade vertebrate predators, but will not function for arthropod predators such as coccinellid and syrphid larvae. 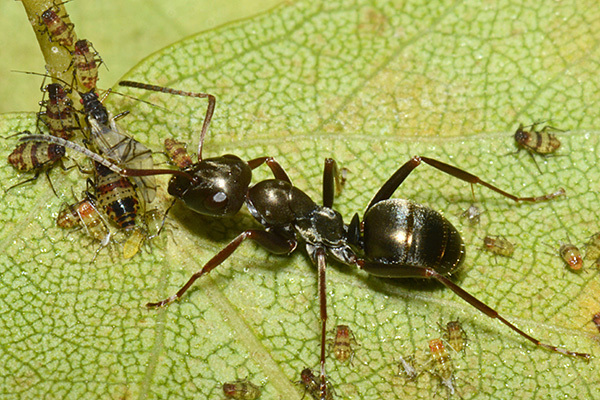 The strategy adopted by Callipterinella for minimizing predation from arthropod predators is to produce honeydew attractive to ants. 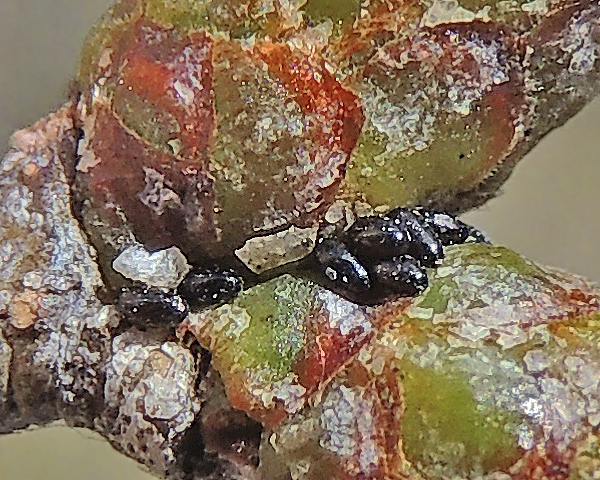 Out of 9 colonies we have examined, nearly 70% were attended by ants, and other workers have also found that the species is nearly always ant-attended. In our case, attendance was always by Lasius niger (see pictures below), with none by Formica, Myrmica or Lasius fuliginosus, despite the fact that these species were present at several sites. Novgorodova & Gavrilyuk (2012) working in Siberia found that Callipterinella tuberculata was tended by eight different species in ants, although they did not indicate which. Tending is most commonly done by stroking with the antennae (see picture above), although we have seen them using both the palpi (first picture below) and the mandibles (second picture below). 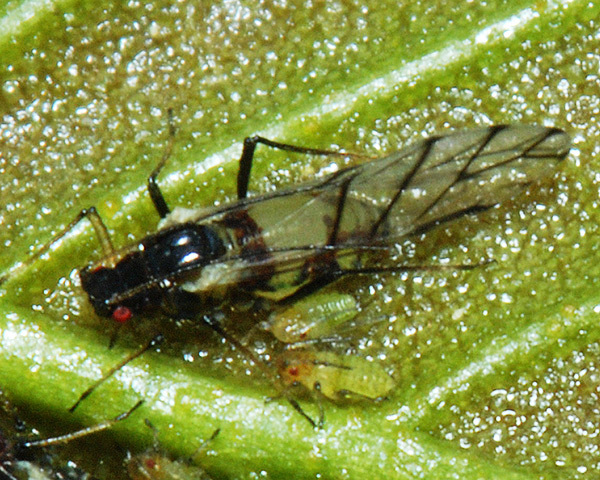 In Belgium Portha & Detrain (2004) found no evidence of competition between Callipterinella tuberculata and another birch feeding aphid, Betulaphis brevipilosa. Instead the two species were positively associated at the shoot level. They suggested that this was a result of aggregation at suitable feeding sites. Colonies of both species were similar or larger in mixed aggregates than in monospecific ones. We have not noted any association with Betulaphis (in our case Betulaphis quadrituberculata), but have on several occasions found Callipterinella tuberculata in mixed colonies with Glyphina betulae (the green aphids shown above). There seem to be very few records of predators taking Callipterinella tuberculata, probably because attending ants keep them away. 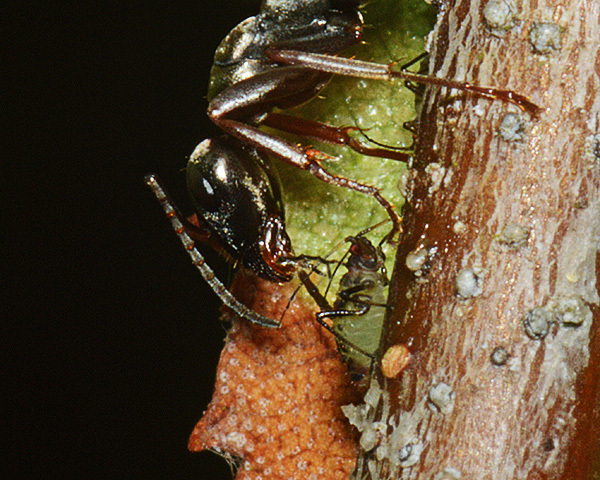 We have observed a predatory cecidomyiid larva eating a nymph at the edge of a colony (see first picture above) and an adult Coccinella septempunctata resting on an infested twig (second picture above). We especially thank Dr László Érsek for the image of eggs shown above, and Alan Outen Bedfordshire Invertebrate Group for his kind assistance when photographing aphids in Bedfordshire.